HI, CATHERINE, WHERE DO YOU HAIL FROM ? I come from the north of France, I’ve had a happy childhood with an edu-cation geared towards sports and nature. After obtaining my masters in management, I’ve got a job as direc-tor of a decoration company in France for 20 years. I’m a sports fan through and through! I was winner of the ‘raid gauloises’, I run marathons, and I love surfing sports (Windsurf, surf, pad-dle…). I live in Mauritius with my family since one year. YOU ARE DEFINITELY A WINNER AT HEART! ANY OTHER WINNING MOMENTS OF YOUR LIFE? everything (my professional life, sports, travelling…) and the birth of my children with whom I live extraor-dinary moments every day! WHAT DO YOU THINK MADE YOU WHO YOU ARE TODAY? Sports competition which I’ve been practicing since childhood (athletics windsurf..) have enabled me to pre-pare myself to life in a positive way, so as to always accomplish my aims and objectives with tenacity and per-severance. Travelling have taught me lots about human touch which can take simple gestures such as a smile! They have strengthened my point of view on human values against the material world which is so felt nowadays. 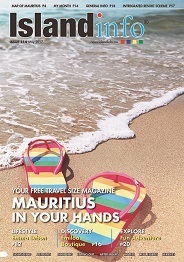 WHAT DO YOU DO IN MAURITIUS? brand. These products are mostly exported towards Europe for a niche market for the time being. sumptuous views, doing the sports I love the most! AS ENDING NOTE, HOW WOULD YOU DESCRIBE MAURITIUS?